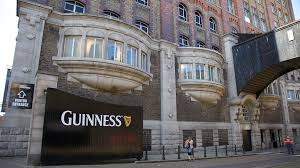 Guinness Storehouse Tour Everyone said we had to see tour the Guinness Storehouse and after checking into our hostel in Temple Bar (the tourist and nightlife hot spot) we decided to walk to St. James Gate. It was our first day in Dublin, it was raining (of course) and we were running on little sleep because of jet lag and an extremely long stop-over in New York. water it takes to make the beer and they had Guinness bottles and cans from different years and various countries. I was surprised and impressed that they had an audio visual station where you could take an informative quiz about your drinking habits and their effects on your body. purchasing anything with the Guinness logo on it. I may have been biased by the jet lag but it really reminded me of a being in a slaughterhouse, where you walk in one door, have to get through all this information, and then leave via another door. If you enjoy beer or really want to take in a neat view of the city, I guess it would be worth it. If you are not a fan of major corporations like Coca Cola or McDonald’s you will probably not enjoy this attraction.